A poor signature consists of one (unary) function symbol, a symbol for equality and a number of constant symbols. Due to the lack of internal structure, interpretations of poor signatures differ from interpretations of richer signatures in some respects. One of them is the completeness of Hoare-like systems relative to the first-order theory of the interpretation. We demonstrate that Hoare-like proof systems for partial correctness are incomplete in any infinite (and not uniformly locally finite) interpretation of a poor signature, even if the systems are supplied with the first-order theory of the interpretation. 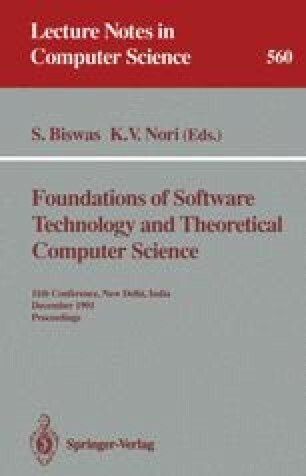 The reason is that there are always relations which are definable by while-programs but not by formulas. This is shown by an application of a result used in model theory. We also answer the question which enrichments of the signature are necessary and sufficient to allow (nontrivial) infinite interpretations where Hoare-like systems are complete. The preparation of this article has been supported by the BMFT (ITS 9002 A). The responsibility for the contents lies with the author.